MIG/MAG welding is also referred to as gas metal arc welding. A differentiation is made between metal inert gas welding (MIG) and metal active gas welding (MAG). MIG/MAG is currently the most frequently used welding process and allows for particularly high welding speeds. It can be used in a manual, mechanized or robot-supported manner. In MIG/MAG welding, a filler metal or welding wire ignites the arc if it touches the component. The consumable wire is used as allowance. In order to protect the arc from the reactive oxygen in the surroundings, a “shielding gas” also flows through the gas nozzle. This suppresses the oxygen during welding and therefore prevents oxidation on the arc and on the weld pool. Which Gases are Used in MIG/MAG Welding? MAG welding uses active gases such as pure CO2 or mixed gases (argon, CO2, O2) in various compositions. These are highly reactive. The MAG process is used for unalloyed, low-alloy and high-alloy materials. MIG welding, on the other hand, uses inert, i.e. unreactive, gases such as pure argon and helium or mixtures of argon and helium. The process is suitable for welding materials such as aluminum, copper, magnesium and titanium. There are various arc types in MIG/MAG welding. They differ in terms of the level of the amperage. In the low power range the arc is susceptible to short circuits; in the higher power range it is free of short circuits. The arc is ignited by brief contact between the wire electrode and the component. This produces a quickly increasing short circuit current, which liquefies the wire electrode and a droplet detaches. After the short circuit, the arc reignites. The dip transfer arc is used in the lower power range for thinner sheets and allows for welding to be carried out in almost any position. The dip transfer arc is also predominantly used in the root pass. The intermediate arc changes between short circuits and spray transitions at irregular intervals. This results in more spatter. An effective use of this arc is not possible, and therefore it is best to avoid it. This arc burns constantly without short circuits in the upper power range and is well suited to the welding of thicker sheets. This means that a high deposition rate and deep penetration are possible. This arc is even more powerful than the spray arc and is used for thick sheets where a high deposition rate is required. The welding droplet is transferred into the weld pool in a rotating movement. The rotating arc is also referred to as a high performance arc. This arc consists of a dip transfer arc and a pulsed arc. The necessary penetration and the heat input are generated in the phase of the pulsed arc, while the phase of the dip transfer arc provides for the cooling of the weld pool and makes it easier to manage. High-quality weld seams with the lowest level of spattering and increased deposition rate. The extremely stable arc allows for the best results with all materials. Modified arc for even better results in MIG/MAG pulsed-arc welding. Which Materials are Suitable for MIG/MAG Welding? The material that is most frequently used in the gas metal arc welding is steel. In addition, aluminum and stainless steel alloys can also be welded well with MIG/MAG. The welding of steel should be easy, robust and cost-optimized so that optimum weld seams can be achieved even under high cost pressure and in less-than-ideal circumstances. WHAT IS … MIG/MAG WELDING? Welding is complex – but understanding the basics is easy. 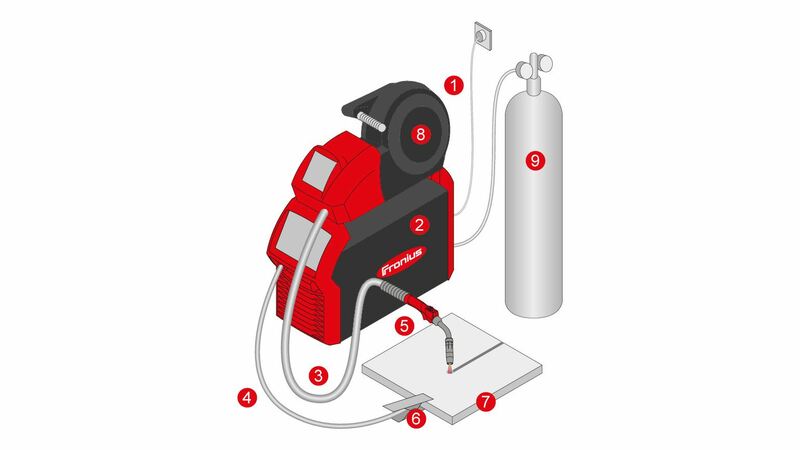 The Fronius “What is…?” series helps to shine a light on the different welding processes and provides an overview of the basic concepts. Spending an entire day at the welding table is stressful. The UV radiation and the welding fumes are just some of the factors that can be dangerous if you do not have the right protection. The correct welding equipment makes the crucial difference in this area.